NETWORK UPDATE: The football adjustments didn’t affect NBC’s numbers, but all of ABC’s shows lost 0.1 in the final count. Football trumped sharks last night, as NFL PRESEASON FOOTBALL on the NFL Network scored a 1.24, with a huge 2.82 in Men 50+. Discovery’s SHARK WEEK followed, with 1.14 for SHARKAGEDDON and 0.96 for I ESCAPED JAWS. BLACK JESUS (Adult Swim) held up extremely well from last week’s premiere down just 0.01 at 0.90. DEFIANCE (Syfy) was also steady at 0.46. Both of USA’s shows were down more than a tenth, RUSH at 0.36 and (off the chart) SATISFACTION at 0.27 (1.1M total viewers). FX’s shows lost all of last week’s gains, with MARRIED down to 0.26/595K and YOU’RE THE WORST at 0.19/415K. Both episodes of PAWN STARS (History) were down more than a tenth at 0.67/0.63, and PROJECT RUNWAY (Lifetime) was at 0.61. On VH1, DATING NAKED was up 50% to 0.30 (741K total viewers), and CANDIDLY NICOLE was up 0.04 to 0.15/375K, but LEEANN & EDDIE was only up 0.01 to 0.12/210K. 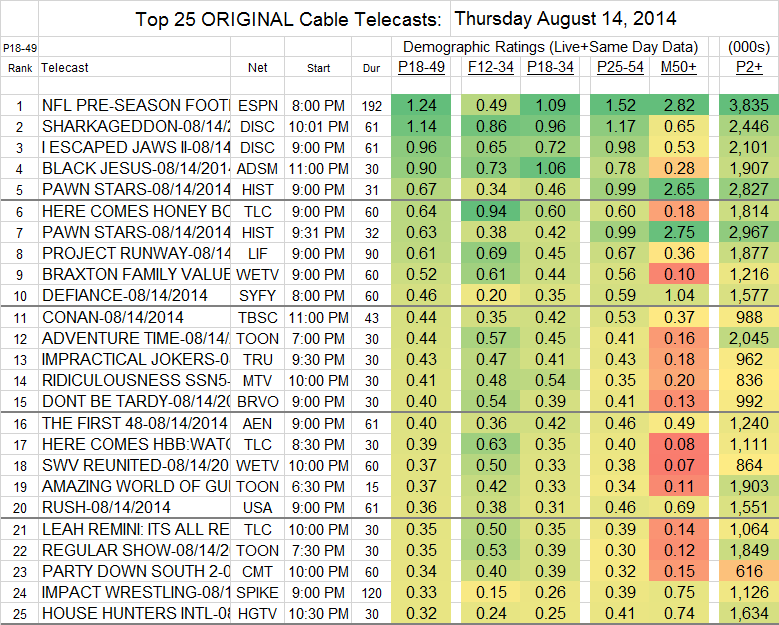 GARFUNKEL & OATES (IFC) grew a bit from last week’s premiere to 0.09/205K. On Sundance, RECTIFY fell badly to 0.02/124K, and THE HONORABLE WOMAN only managed 0.014 and 100K viewers if you added together its 10PM and 1AM airings.